While your mind might love the extra snooze, it can wreak havoc on your body. We all love the relief of going back to sleep for that extra 5 or 10 minutes, and now it’s easier than ever. Our phones are the most common culprit, but even stand alone alarms, watches, bedside clocks and tablets include this feature. However, the effects that pressing that irresistible snooze option has on your body in the short or long term, aren’t really that appealing. Your heart beat, blood pressure and breathing increase during rapid eye movement, or REM, sleep when your mind is the most active and you’re dreaming. They all drop to just two-thirds of your normal resting state during non-REM sleep, though. According to Professor Matthew Walker at the University of California, this is also when you’re most vulnerable to heart attacks. The sudden shriek of an alarm causing your fight or flight response to spike your body with adrenaline and kick your heart into overdrive. If a single alarm weren’t bad enough, Prof. Walker says “using the snooze feature means you will repeatedly inflict that cardiovascular assault again and again within a short span of time”. If you must snooze, use an alarm sound that starts quiet and slowly gets louder instead. The hormone melatonin is regarded as the “sleep hormone”, released by the brain to control your sleep and wake cycles. Cortisol, on the other hand, is a steroid hormone that is slowly released as you wake up and regulates your body’s metabolism, helps with memory and raises your blood pressure. Hitting snooze several times a day confuses your brain and disrupts the natural flow of these hormones. Going back to sleep in-between your alarms means you’ll feel groggy or “sleep drunk” as your cognitive functions are suppressed. 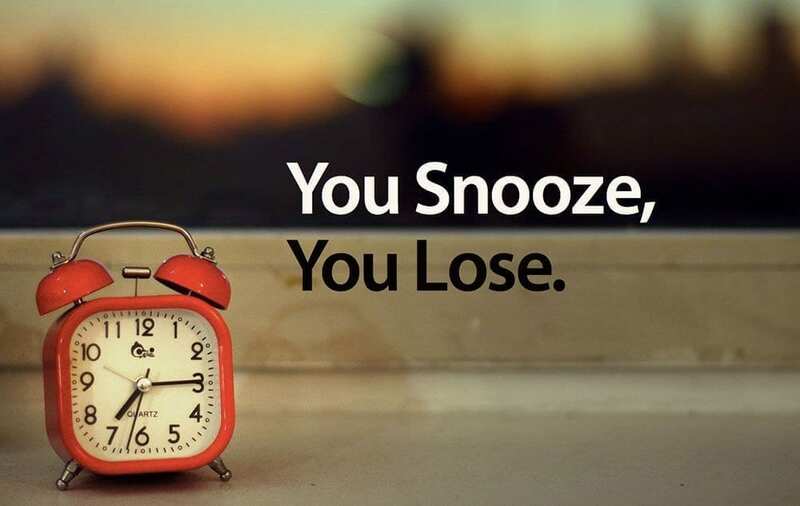 Abusing the snooze may be a result of poor quality sleep, which will only exacerbate the problem. The “hunger hormone” known as ‘ghrelin’ is released in small doses by your stomach and small intestine as you wake up, the lack thereof killing your appetite. You may not feel hungry until later in the day and get it in force or have a late-night munching session. Your body also begins peristalsis as you awaken – small wave-like contractions that moves food through your digestive tract. Disrupting these processes with constant snoozing reduces the likelihood of passing a stool in the morning, eventually leading to constipation and bloating. What is the solution to a snooze addiction? Dr. Christopher Winter, Medical Director at the Martha Jefferson Hospital Sleep Medicine Center believes you can fix your habit by limiting yourself to just one snooze, using the 5 or 10 minute break to sit awake in bed and let your body’s natural processes kick in, let your hormones equalise and blood pressure rise until you’re ready to start the day with a light bite to eat. Keep things calm, focused and grounded with our diploma-correspondent Aura & Chakra Energy Healing course, or master your thoughts with our Meditation and Mindfulness courses. If you’re interested in complimenting the holistic qualifications you already have, try out our Professional Relaxation Therapy Course and discover what defines the very thing modern society is getting worse at. Whatever you choose here with us at The School of Natural Health Sciences, you can be sure that your CV, spectrum of knowledge, and outlook on life will be forever enriched.